On a warm winter day in January, I had the opportunity to sit down with the head winemaker and owner of Vignobles David, and Shai Ghermezian, executive vice president of Allied Importers, who imports the wine into the country. The winery’s 114 acres of vineyards are located on the southern side of the Rhone Valley, in front of the famous Pont du Gard, within the triangle-shaped area of Avignon, Nîmes and Uzès. The name of the winery is given for the name of its owner, Fred David, who can been seen partially obscured behind his wine, in the picture to the right. However, it is also very apropos to the work that the David does full time, that being a vigneron for his Vignoble, or in English a wine maker manicuring his vineyard. A vigneron in its purest sense, means a person who not only makes wine, but one who also tends to his vineyards. There really are very few true vigneron left out there, simply because of the sheer effort and time required to do it. Of course, Fred has people who help him, but he runs an independent family owned winery whose vines are all tended to in an organic manner. 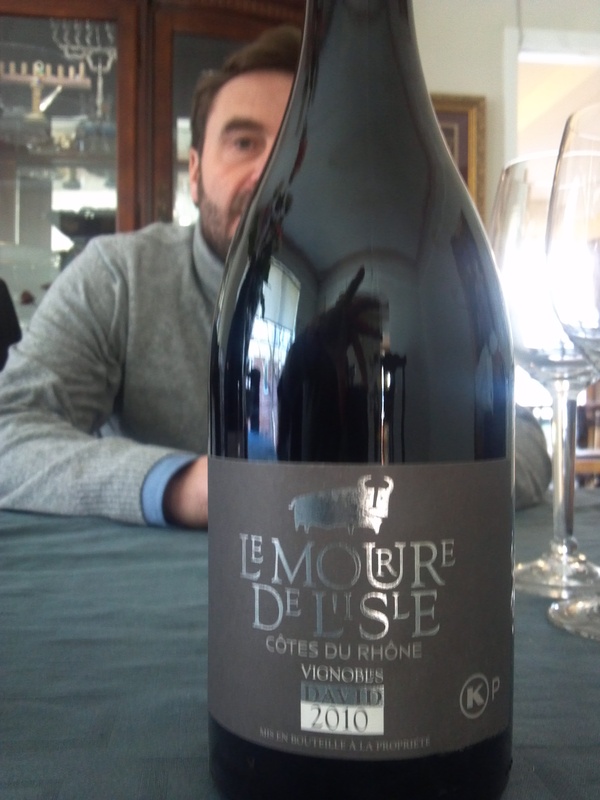 Most people know this winery by the name of the kosher wine it sells here in the US: Le Mourre de l’Isle. 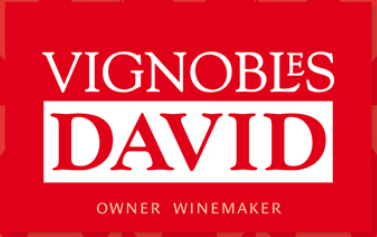 Actually, the name of the winery, as we said above, is Vignobles David. Please keep the real winery’s name in mind, so you can be on the lookout for the other kosher wines that Allied will be importing from them in the near future. As larger conglomerates are buying up more and more wineries, wineries like Vignobles David are standing their ground and producing wonderful wines in an ecologically friendly manner to boot. The winery has been around since 1991 and has been producing kosher wines since 2005. The winery also produces a kosher Rose but that is sold exclusively in Europe. This year, David has added a reserve wine to both his kosher and non-kosher lineup that he is going to release here in the US sometime in February. As we were sitting around Ghermezian’s table, the conversation moved in many different directions. I could not help but ask questions about the wine business from two people whose very life depends on it. As I listened to the conversation I was fascinated by the way that Mr. David reminds me of another true vigneron, who is also a very good friend, Benyamin Cantz of Four Gates Winery. They both create kosher wines with rich intensity; they both mind their vines and care deeply about their craft. Obviously, David’s operation is many times larger than Four Gates, and one is in the US and the other in France, but I could not help but take notice of the common threads in their lives and the wines that they produce from their vines. Discussing terroir with a Frenchman is truly enjoyable, but doing it in French is even more fun. I dabble in the romantic language and it was a joy talking with David in his native tongue, even if I did mangle a few of the words. As the discussion moved to his wines, I asked why he does not sell his Rose here in the US? Mr. Ghermezian showed interest and yet, Mr. Davis explained that while the US market enjoys his wines, he is able to sell his entire stock in Europe, whether kosher or not. Actually, the majority of his wine is not kosher and it sells out in Europe, with his customers asking for more. Yet, he creates kosher wine because of his religious beliefs. The cost of the kosher wine is slightly higher than the non-kosher variation, simply because of the extra costs that the kosher wine production entails, and yet I could not help but sense his pride in its production as we were talking. The complexity of creating a kosher blend comes down to a tradeoff between cost or quality. The reason comes down to the rate of ripening of different grape varietals, Grenache does not ripen at the same time as Syrah or Mourvedre. So if one wants a kosher blend, he must have kosher supervisors there for three pickings to maximize the blend’s potential, or pick once and hope for the best. With great pride and precision, Mr. David explained that he had kosher supervisors at his winery for some thirty or more days! From the first picking all the way to the last picking, then through the fermentation, and finally culminating with the wine’s internment into concrete or oak. Each step requires the supervision and it also requires his constant focus, which is not his only task or distraction, as he must still create his other non-kosher wines that are all coming ripe at the same time.